We use E. coli's native Cpx signal transduction system to internalize the signal created by antigen binding. As explained here this system depends on several protein-protein interactions. We tested which one of these interactions was most suitable to link to Bimolecular Fluorescence Complementation (BiFC), both in the wet-lab and the dry-lab. Here we show how we used and combined the output of both projects. We went through several iterations between the model and the lab work which are explained in more detail below. First, we modeled three possible systems to visualize antigen binding with the Cpx system, and found out which parameters we had to optimize in the lab to get the fastest and most reliable signaling. We took these recommendations to the lab and found which candidate system is most suitable for antigen visualization, and under which conditions this system works optimally. We used the data gathered in the lab to fit with our mathematical model, and used this to give recommendations as to how our signaling system can be optimized experimentally. We found several parameters that could improve the speed of our signaling, and we integrated our system with the "Fluorescent Protein" project to test this hypothesis in the lab. First, we aimed to find out which protein-protein interactions in the Cpx pathway were most suited to visualize Cpx activation by connecting the interacting proteins to a BiFC reporter gene (Figure 1). 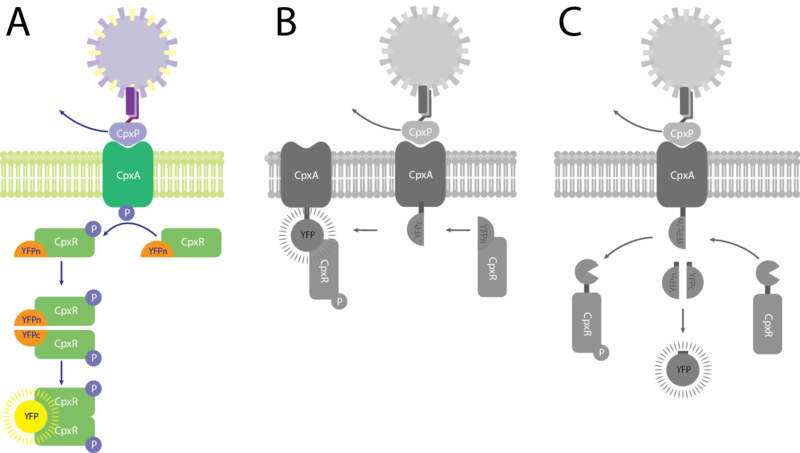 Three candidate systems were analyzed, which were based on either CpxR-CpxR dimerization (Figure 1A), CpxA-CpxR phosphotransfer (Figure 1B) or CpxA-CpxR phosphotransfer combined with specific TEV-cleavage (Figure 1C). While the constructs for the wet-lab were created, initial in silico tests were performed. We decided that protein concentrations and signal activation through antigens were the most important variables to test. Using our models, we simulated the effect of CpxR protein levels and antigen levels on production of a fast and intense signal. These effects could also be later tested in the wet-lab. Figure 1: A) eYFPn and eYFPc are fused (seperately) to CpxR. This way BiFC is used to visualize the CpxR dimerization step. B) eYFPc is fused to CpxA, and eYFPn is fused to CpxR. This way, BiFC is used to visualized the phosphorylation step of the Cpx pathway. C) TEV protease is fused to CpxR, and eYFPn and eYFPc are fused to CpxA (seperately). Upon Cpx pathway activation, the eYFP-termini are cleaved off of CpxA. Leucine zippers are fused to the eYFP-termini to enable the reassembly. We quickly found out that mathematically a system based on CpxR-CpxR dimerization (Figure 1A) was the most promising to construct in the lab as it shows strong and specific fluorescent signals in silico. This is likely due to one activated CpxA molecule amplifying its signal by phosphorylating several response regulator CpxR proteins. Results of all three systems can be seen at the Cpx Kinetics page. Although the signaling kinetics of the CpxA-CpxR systems (Figure 1B and C) are dependent on the right CpxA and antigen levels in the sample, visualizing CpxR dimerization generates a fluorescent signal over a wide range of CpxR protein concentrations. Moreover, the intensity of the fluorescent signal increases when CpxR protein concentration increases. It even shows that the maximum reached YFP concentration is limited by CpxR, which can be increased in the lab. The strongest signal will be obtained when CpxR expression and Cpx activation are maximized (Figure 2). Figure 2: Relative fluorescent signal intensity (orange) and signaling speed (green) are plotted against the initial concentration of CpxR. Data is modeled for the CpxR-CpxR dimerization system (Figure 1A). We went into the lab to test these hypotheses! To test these hypotheses, we created constructs in which we coupled split eYFP halves to CpxA and CpxR respectively and placed them under control of the inducible pBad/araC promoter. We transformed E. coli K12 with these constructs. The Cpx system was activated with the known activator KCl in different concentrations to mimic different antigen concentrations at a time-point of 20 minutes. We quickly found out that the systems based on CpxA-CpxR interaction did not generate a clear fluorescent signal, which matches the prediction of the model. Furthermore, we show that visualizing CpxR dimerization with BiFC is indeed a viable option. Because we put the CpxR-eYFP-termini construct under control of the inducible pBad/araC promoter we were able to test hypothesis 1: The strongest signal will be obtained when CpxR protein expression is maximized. We found out that this is indeed true (Figure 3A, B and C). To find out how we obtained this results, please visit this page. Figure 3: A) CpxR dimerization visualized with different L-arabinose (L-ara) concentrations over time. B) CpxA-CpxR protein interaction visualized with different L-arabinose concentrations over time. C) CpxA-CpxR protein interaction visualized with different L-arabinose concentrations over time. Upon Cpx activation, eYFP-termini are cleaved off of CpxA by TEV protease and reassemble in the cytoplasm using leucine zipper's natural affinity for each other. We then set to test hypothesis 2: The strongest signal will be obtained when Cpx activation is maximized. In Figure 4 we show that this is true. We mimic antigen binding by adding a known activator of the Cpx pathway, and by increasing its concentration, the fluorescence intensity also rises (Figure 4). We took this data back to the dry-lab to further improve our computer model! 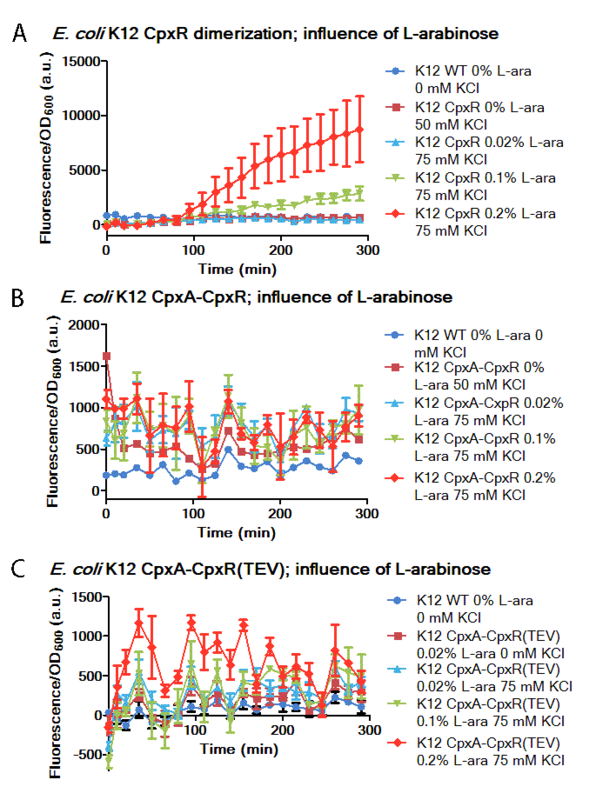 Figure 4: CpxR dimerization visualized with L-arabinose concentration of 0.2% and different activator concentrations over time. To learn about the characteristics and potential of the system built in the lab, the experimental data was compared to the model. A parameter set was found which gave a similar YFP production to the experimental data (Figure 5). By doing this, we found that the best fitting parameter set showed a relatively high fluorescence intensity, but it was fairly slow compared to other parameter sets. This means that there is still room for improvement. 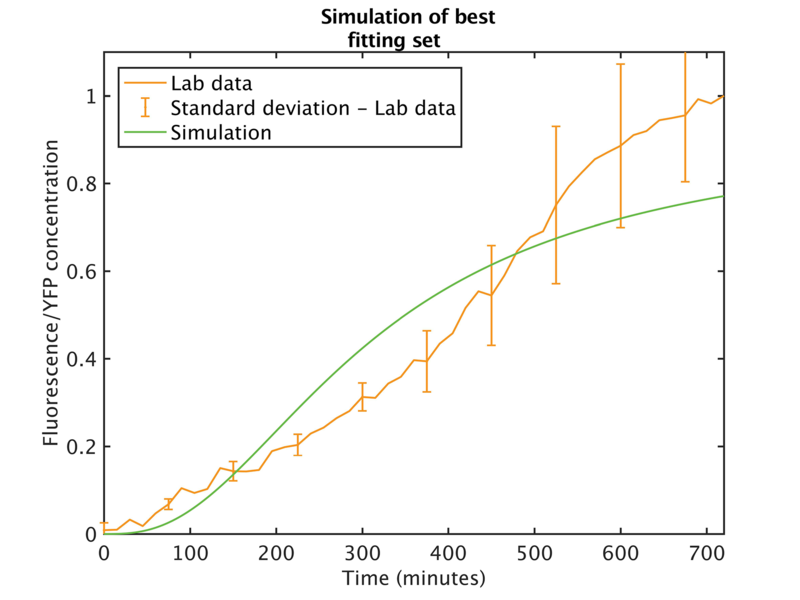 Figure 5: Comparison of YFP concentration over time using data measured in the wet-lab and a model simulation using the best fitting parameter set. Of course, to improve the current signaling system we want to know which parameters should be changed in order to increase the YFP signal and the response speed. To assess this, each parameter of the best fitting set was individually varied between 0.001 and 1000, keeping the other parameters constant. The effect of this change on the maximum achievable YFP concentration and production speed was calculated (Figure 6). Figure 6: A) Effect of parameter variation on the maximum fluorophore concentration. B) Effect of parameter variation on the speed at which the fluorescent signal is produced. This figure shows that the maximum YFP fluorescence has more possibility to be improved than the speed at which YFP increases. Both system properties could be profoundly improved by increasing the kinetic rates for antigen binding by the affibody and CpxR-eYFPc phosphorylation (find all the used parameters here). However, given the iGEM time limits, it was not feasible to confirm this hypothesis in the lab. One viable option to improve system performance was to use a fluorophore with a faster maturation time. We aim to improve the response time of our visualization system. As stated, our model shows that this can be done by using a faster maturing fluorescent protein. During our "Fluorescent Protein" project we tested a number of fluorescent proteins, of which mVenus showed one of the highest levels of brightness and a high percentage of fluorescence reconstitution. Furthermore mVenus is designed to have a fast and efficient maturation time , exactly what we need! We show here how this experiment was designed. The results show that usage of mVenus over eYFP as a reporter protein increases the strength of the produced fluorescent signal more than five times. Unfortunately, the background signal also increases a lot, which means we lose a lot of sensitivity. This means that mVenus is not a suitable candidate to visualize antigen binding. At this moment, we recommend using sfGFP as a reporter for antigen binding. We found out sfGFP is thermostable and has efficient maturation at high temperatures. Moreover, it is one of the fastest and brightest reporters we tested. 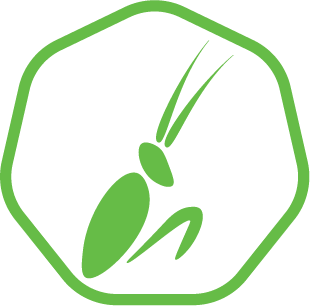 During this project we modeled and experimentally tested several methods to find the optimal visualization method to use in Mantis. Three strategies were tested to find the optimal visualization method of antigen binding using the Cpx pathway. In the end, it was clear that fusion of eYFP-termini to CpxR and measuring its dimerization shows clear fluorescence within two hours after activation, even at low concentrations. This shows that we found a potentially usable method of rapidly and specifically measuring antigens in blood. 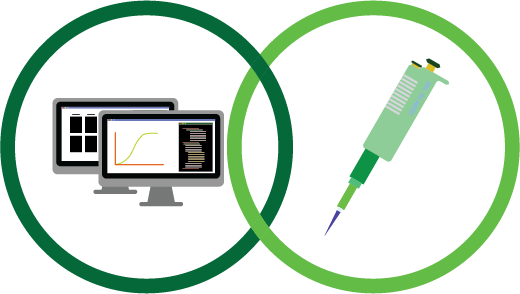 During this project, we constantly implemented results from the computer modeling into the experimental design, and vice versa. Doing so, we were able to predict correct induction and activation levels. This yielded experimental results which could be implemented in the model and gave us indications on how to perfect Mantis. Furthermore, we had time to integrate this combined modeling and experimental project with another wet-lab project, where we analyzed several split reporter proteins to potentially use in Mantis. Nagai, T., Ibata, K., Park, E. S., Kubota, M., & Mikoshiba, K. (2001). A variant of yellow fluorescent protein with fast and efficient maturation for cell-biological applications. Nature Biotechnology, 20, 1585–1588.